As a result of the recent bad reputation of fats, most people have switched to eating more processed foods containing sugar and refined fats instead. This has led to an epidemic of obesity all over the world. With recent information however, it is being realized that fats are not the devils they were made out to be. 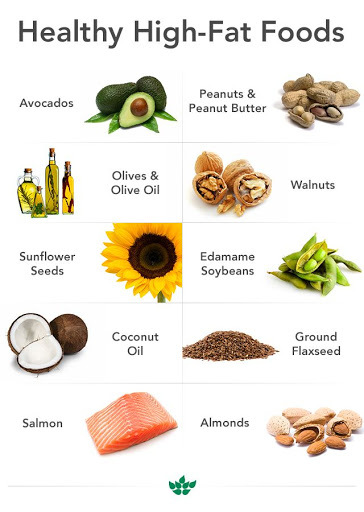 Here are some high-fat foods that are incredibly nutritious and healthy. Avocados differ from other fruits in that they contain mostly fats, instead of carbs. They contain even more fat than some animal foods. The main fatty acid in avocados is oleic acid, also the main fatty avid in olive oil. Avocados are also a good source of potassium and fibre. Cheese is a great source of calcium, selenium, phosphorus, and numerous other nutrients. It also contains a high amount of protein. Cheese also contains beneficial fatty acids which can help reduce your risk of developing type 2 diabetes. Whole eggs got a lot of hate because its yolk was high in fat and cholesterol. Recent studies however indicate that cholesterol in eggs do not affect blood cholesterol in most people. Whole eggs are also high in vitamins and minerals. It also contains powerful antioxidants which can help protect your eyes and brain. Fatty fish like trout, tuna, salmon and mackerel are loaded with heart-healthy omega-3 fatty acids, high quality proteins and various important nutrients. Eating fish can help lower your risk of depression, dementia and heart disease etc. Fish is one high-fat food you should consume more of. Nuts are high in healthy fats and fiber, and are a good plant-based source of protein. They are also high in vitamin E and magnesium. Eating nuts can boost your health and lower your risk of type 2 diabetes, heart disease and obesity. Examples of these healthy nuts include walnuts, almonds, groundnuts etc.